The program will be divided into two distinct sections and each can be delivered as a standalone program or together. The medical speciality training will be offered to residents in both Australia and New Zealand. General introductory session for residents who intend to enter a surgical specialty program. We also offer small group training divided into surgical specialties for residents in Australia and New Zealand, who have been selected for interview. One 2 hour session will be presented for all doctors who wish to attend. There will be an opportunity to ask individual questions after the session. Understanding the question and what do they really want to know? How to structure answers based on the most common styles of questions and integrating the appropriate core competencies within the answer. Answering questions and making decisions that are uncomfortable. Selecting appropriate examples to demonstrate knowledge, experience and personal attributes. Language to use at interview. Examples will be used to demonstrate how to connect the participant’s experience to answering interview questions. Each participant will be provided with brief reference notes and a copy of the eBook Impressive Interviews – Your pocket-sized personal interview trainer. Two sessions of 2 hours for each specialty group and 30 mins post training for any additional questions. This is an intensive program based on the specific approach each surgical specialty uses for selection into its training program. The individualised approach provides the techniques required to prepare for the interview, be able to fully answer questions and build confidence. The focus of this program is on the individual participant, using an interactive and practical approach based on the surgical specialty. Number of small groups will depend of the number of candidates per specialty Maximum 3 participants per group. For details and pricing of Medical Interview Preparation contact Deborah Barit on (02) 9331 1853, mobile 0412 007 682, by email: use the form at the bottom of this page. Deborah Barit has over 10 years experience successfully training doctors for medical specialty interviews. Many of her clients who had previously been unsuccessful in gaining entry and were told to get some interview training have gained entry into their specialty of choice. Other clients have been successful on their first application. Training options include face to face with or without video and Skype. Some doctors have travelled from interstate and New Zealand for face to face for the initial interview training/coaching and then continued on Skype. Deborah travels interstate to deliver job interview information sessions, specialist group training programs and individual coaching sessions. She also conducts Medical Interview Training in Sydney, Melbourne and other states in Australia. Success rates vary, however overall the success rate is 75% with several of her clients coming top in Australia and New Zealand. RMO, SRMO and unaccredited specialty positions. 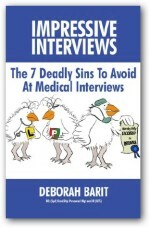 "The Seven Deadly Sins to Avoid at Medical Interviews" now!